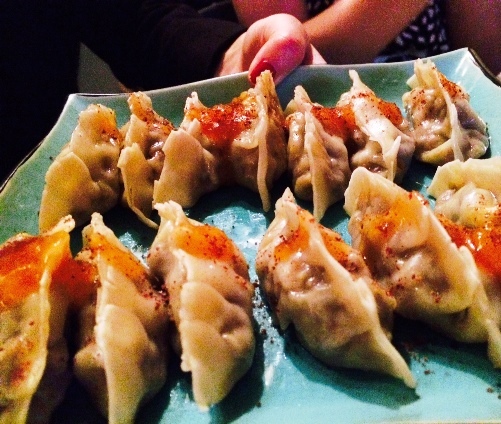 Pinch pop-up: dumplings with a difference! Just when I was starting to think pop-ups had had their day, along came one that blew me away. Ok, it’s been a long day, and when a copywriter gets to that tired-and-slightly-hysterical stage, they start doing alliterating headlines and rhyming introductions. Enough already. So a nice American lady called Megan Vasko invited me to her pop-up the other week. She said she knew a friend of mine who’d worked at MegaCorp, and she’d run into the Honey Badger at a Beer Meet-Up group a couple of years ago (Beer Meet-Up? Isn’t that just drinking? ), and she’d spent some time at the same university as me… There were so many connections, I had to say yes. 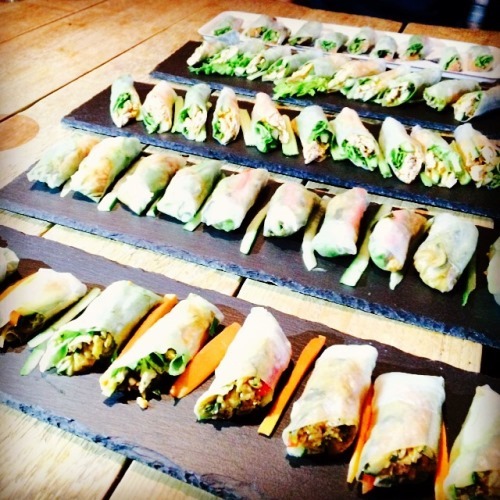 Pinch’s fresh spring rolls – my favourite being the Buffalo Chicken! The pop-up was held at Tunnel37, which is a great little space for foodie entrepreneurs (take note, aspiring pop-up chefs!) – I’d been there before for pho from the Banh Mi Girls, and this time it had been transformed into a veritable dumpling factory. Megan’s concept, known as Pinch because of her propensity to pinch a bit of this and a bit of that from various cultures, essentially serves up two things: fresh spring rolls and dumplings. Fusion-style. When I say fusion-style… think spring rolls filled with smoked salmon, asparagus and dill. Or my favourite: the “Buffalo Chicken FSR” stuffed with chicken in hot-wing sauce and ranch dressing, served with blue cheese on the side. A classic vege Pad Thai was on the menu too, which was also delicious but wasn’t the reason I was there. Everything came with a range of sauces – from the green ‘n garlicky “Crocodile” sauce to a sweet ‘n spicy mango chutney. 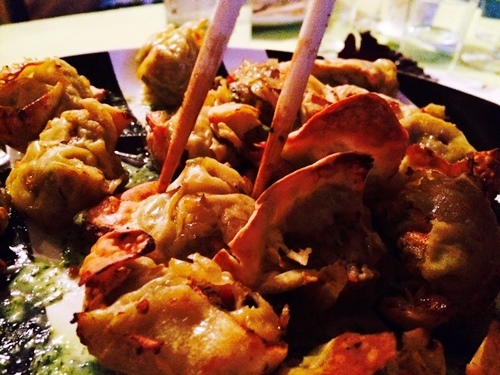 The dumplings that were up next were even more exciting. While we started with a classic Asian-style pork dumpling, things quickly moved onto steamed parcels of saag paneer. 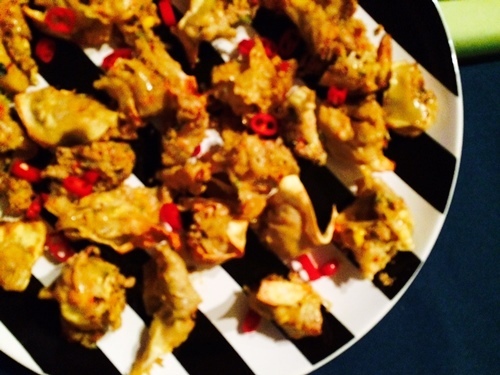 Two crispy wonton-style dishes appeared: one filled with Thai green curry-marinated chicken; the other stuffed with a spicy chicken and corn barbacoa mixture. 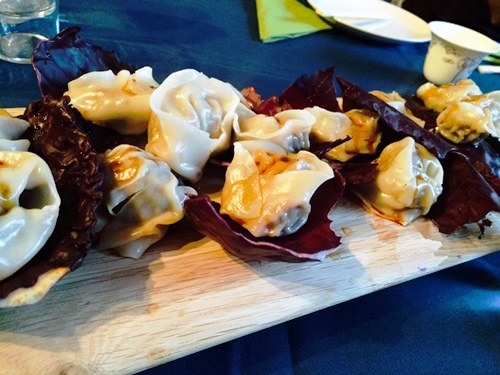 Each new plate of dumplings took the flavour levels up another notch (kind of a like a wine tasting?! ), and I finished by stuffing my face with a spicy, dried-fruit-heavy, South African-inspired, meaty bobotie number. So here’s the thing: if you’re a purist, steer clear. But if you’re feeling open-minded about your singular spring rolls and daring dumplings (there I go with that alliteration again), then don’t miss out on potential Pinch pleasure. Megan regularly pops up at Restaurant Day, the monthly Neighbourfood Market, and Tunnel37, but you can also hire the Pinch team for catering gigs. A pop-up dinner (excluding BYOB) would usually cost €25, and individual portions of three spring rolls with sweetcorn salad cost €6.